Apple Awarded $120 Million In Patent Suit Against Samsung : The Two-Way Apple had been seeking more than $2 billion in damages. The jury also awarded Samsung $158,400 for Apple's infringement. 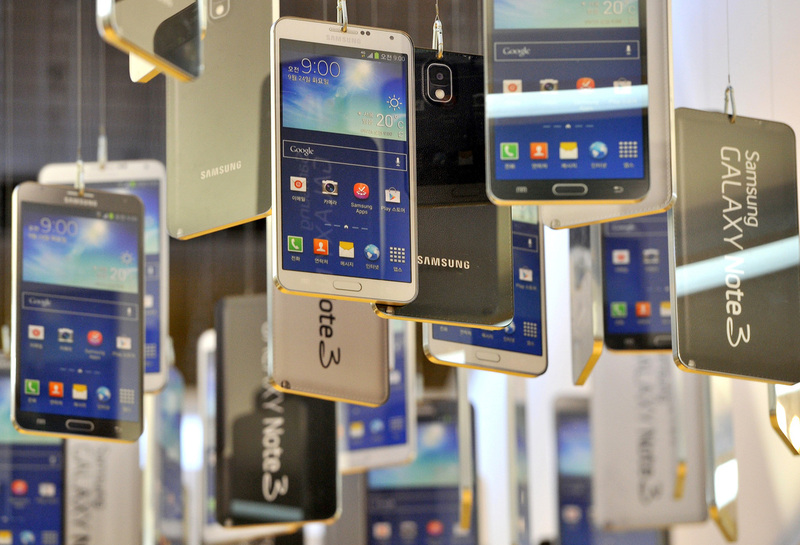 Cardboards of Samsung Electronics' Galaxy Note 3 are seen in a showroom at the company's headquarters in Seoul in November of 2013. In a second high-profile legal fight, a federal jury sided with Apple, ordering Korea's Samsung to pay nearly $120 million for infringing on some of Apple's patents. While it was a clear victory for the Cupertino-based Apple, the damages awarded were nowhere near the $2.2 billion the company had been asking for. In fact, the jury also awarded Samsung $158,400 in damages, because Apple infringed on one of its patents. "The jury found all accused Samsung phones infringed on the first patent at issue, the '647 quick links patent, but ruled various phones did not infringe on two others related to universal search and background synchronization. For the '721 'slide-to-unlock' patent, it ruled some Samsung products infringe, while others did not. "For a fifth patent, the judge had ruled that Samsung's products infringe on the Apple patent and the jury determined that infringement was willful. "The verdict was reached after three full days of deliberations." Back in August of 2012, round one of this fight was dubbed the "patent trial of the century." A jury awarded Apple $1.05 billion in damages, but a judge later threw out about $405 million of that amount. The Wall Street Journal reports Samsung was seeking $7 million in this suit. "Apple has said Samsung has artificially low-balled its damages request to devalue patents," the Journal reports.